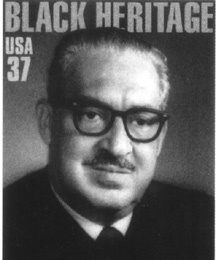 Thurgood Marshall is one of the most well-known figures in the history of civil rights in America and the first Black Supreme Court Justice. At that time, he became the Justice with the most experience arguing before the Court. He served on the Court for 24 years until June 28, 1991 when he announced his retirement due to advancing age and deteriorating health. He passed away January 24, 1993.